It wasn’t until Michael Jordan’s comeback in 1995 that he went missing from the rosters of NBA licensed video games, at least on a regular basis. 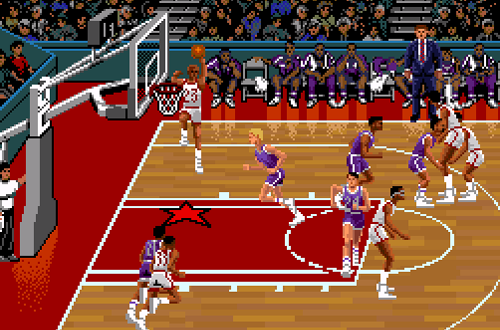 There are at least two versions of Tecmo Super NBA Basketball for the Super Nintendo, one of which does include Jordan, and another which replaces him with a fictional placeholder, something we’d come to refer to as a Roster Player. However, he did appear in Electronic Arts’ NBA Playoffs series (the forerunner to NBA Live), as well as NBA Showdown, NBA Live 95’s immediate predecessor which was released the year after MJ retired, but featured 1993 season rosters. 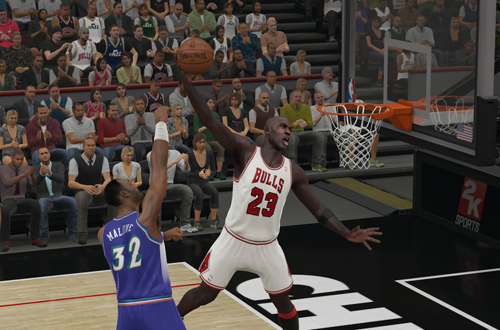 EA also produced a couple of games that prominently featured MJ, including Jordan vs. Bird and Michael Jordan In Flight. Jordan vs. Bird is noteworthy for its inclusion of a primitive dunk contest mode, while Michael Jordan in Flight boasted reasonably sophisticated replay editing functionality for its time. 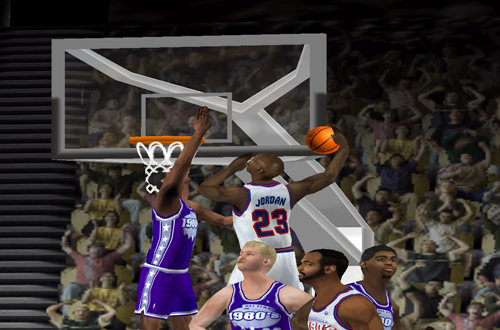 MJ was also included in Beam Software’s NBA All-Star Challenge, an interesting game that I’ll talk about in more detail some time. Going back to EA, they also developed Michael Jordan: Chaos in the Windy City, a sidescrolling platformer that’s very much “love it or hate it”. 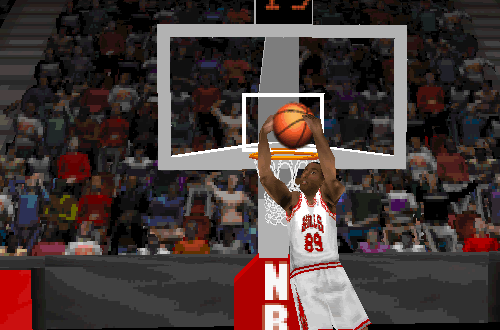 Those early basketball games don’t hold up as well as NBA Live 95 and its immediate successors, but if there’s one thing they had going for them, it was Michael Jordan. Michael Jordan’s return to the NBA came too late for him to be included in the PC version of NBA Live 95, which featured updated 1994/1995 season rosters. This was long before the days of official roster updates, so it fell to gamers like our co-founders Tim, Lutz and Brien, to create the necessary tools to add him to the game. Charles Barkley and David Robinson were also missing from the PC version of NBA Live 95, due to licensing agreements with other developers. The Admiral would return in NBA Live 96 and appear in every NBA Live game for the rest of his career, while Sir Charles wasn’t officially added until NBA Live 98. MJ however would not officially appear in a basketball game for the remainder of his career with the Chicago Bulls, which led to the common inclusion of a placeholder player. We came to refer to these placeholders as Roster Players, as that was the name that EA Sports gave them, and NBA Live was the most prominent and successful NBA game at the time. Other games used similar naming conventions however, such as Roster Guard. In NBA Live 97, the Roster Players representing Jordan and Barkley had bio data that was very close to the real players, but later games ensured that while Fake Jordan played like the real MJ, he bore no resemblance to him, had distinctly different (or indeed minimal) bio data, and wore a jersey number in the 80s or 90s. NBA Live 2000 is still considered one of the best releases in the NBA Live series, and it was indeed a great basketball game in its time. It introduced the first fully fledged multi-season mode, and included an impressive roster of Legends for us to play with. I remember being very excited to read on the NLSC – I was still running the NBA Live Domain at that time – that EA Sports had come to an agreement with Michael Jordan, and that he’d be in the game at long last. It’s just a shame that it came not long after his second retirement. Having MJ in the game was obviously a huge selling point, and he shared the cover with reigning Finals MVP Tim Duncan, in the form of an insert. He was also used in the branding of the game’s One-on-One mode, in which he was the default opponent. Beating MJ in a one-on-one showdown was also the method of unlocking him in the Nintendo 64 version of NBA Live 2000, being the only Legend available on that platform. Jordan remained in NBA Live as a Legend through NBA Live 2004, which meant we missed out on having him in the first game in the series to feature the slam dunk contest. Fortunately, our patching community quickly got him into NBA Live 2005, allowing us to re-create his duels with Dominique Wilkins. Although it tends to be glossed over a little in retrospectives of his career, there’s no getting around the fact that Michael Jordan did indeed play two seasons with the Washington Wizards, instead of finishing his career with that game-winning shot in the 1998 NBA Finals. His comeback in 2001 also marked the first time he appeared as an active player in an EA basketball game since NBA Showdown, and I recall a bunch of screenshots featuring him being released very soon after the official announcement. Firing up the game and seeing him on the Wizards’ roster was just as strange and surreal as his first photo shoot following the announcement, not to mention watching him play in a Wizards uniform for two seasons. Jordan’s last game as an active player was NBA Live 2003, and he was one of the players who appeared in the background of the main menu, showing off the new Freestyle Control moves. I remember being somewhat bothered by the fact that he was assigned a dunk package that mostly had him performing layups, with the occasional two-handed dunk. Granted, he was no longer a high flyer at that point, but he’d still throw down the occasional one-hander, so it just didn’t seem suitable. Needless to say, that was one of the first things that I changed when I was working on the NLSC roster update for the 2003 season. Putting a retired player on the cover of your current NBA game generally isn’t the done thing, but when the retired player in question is Michael Jordan, it’s far from being an absurd idea. But MJ wasn’t just the cover player for NBA 2K11; the game also celebrated him with the Jordan Challenge, a detailed recreation of key games in his career with the Chicago Bulls that featured authentic historical rosters…well, authentic starting line-ups, at the very least. Jordan was also one of three different cover players for NBA 2K12 along with Larry Bird and Magic Johnson, as Visual Concepts had another hit with the fantastically detailed NBA’s Greatest mode. The historical content in recent NBA 2K games hasn’t been all about Michael Jordan (NBA 2K11 aside), but he’s obviously a marquee attraction. Frankly, what VC has done with all that stuff is remarkable, given all the hurdles with likeness rights. Historical teams are something we’ve wanted for a long time – poking through NBA Live 08’s databases reveals that they were planned for the game, but ultimately fell through – and despite expiring likeness rights thinning the rosters a little as the years have gone by, 2K’s old school content is deep and most welcome, in MyTEAM and other modes. His Airness in particular looks spot on from his face to his jumpshot, and the wagging tongue is a very nice touch. He may not have been in a lot of games in his prime, but Visual Concepts have certainly made up for that. I expect I’ll take some time out this weekend to enjoy some old Michael Jordan highlights, and probably take to the virtual hardwood with him as well in at least one of the aforementioned games. For those who may have missed it, I’ve released a raw demo of an Ultimate Jordan roster for NBA Live 08, which I’m also hoping to convert for use with NBA Live 2005 through 07. In the meantime, feel free to share any thoughts on Michael Jordan and his presence in basketball video games in the comments section below, as well as take the discussion to the NLSC Forum. Thanks for checking in this week, please join me again next Friday for another Five! I forgot about the years of having to create Jordan in nba live with friends so we could play a 4 player mode Bulls season. My 2 friends would jump straight to battling it out for player lock on Jordan and Pippen while I would usually take the roll of Dennis Rodman, the other would puck up Harper and Luc. Fun times indeed! My cousin and I used to prefer to play co-op back in the day, too. We’d always try to get through a few seasons whenever he came down to stay for the school holidays. We still get together now and again for a weekend of 2k and more recently nba live but our team gaming skills are shot after a few beers now. I was actually talking last night about this and one friend reminded me of when we injured one of our own players in nba live by hitting the “Push” button, remember that! Ah, the old “hand check” button. Probably not about to make a comeback any time soon!